Nokia users will be able to make Skype video calls for free as of today, courtesy of a new app from Fring. Fring is a big player in the mobile communications market. In the past, the company's apps have offered up a whole load of interactivity that we now take for granted on a mobile phone before anyone else – including free access to Twitter and the like. Now Fring is bringing Skype video calls to web-enabled Nokia handsets. 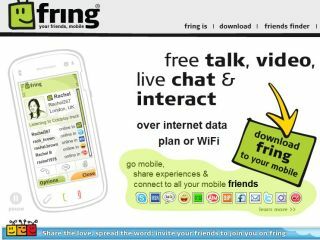 "Fring was the first to bring Nokia, iPhone and Android users the choice to make free calls together with live chat over their devices' internet connection, the first to enable cost-saving mobile twitter over internet, and now we're proud to continue leading the field with the world's first mobile video over internet including Fring and Skype mobile video calls," said Avi Shechter, Co-Founder & CEO of Fring, about the new app. The handsets that are compatible with the app include: Nokia X6, N97 mini, N97, 5800, N95 8G, N95 and N82 devices. Fring is hoping to bring the application to more devices and operating systems soon. To find out more, visit www.fring.com/default.